The contract research aspect of Devencenzi Ag Pest Management & Research has been ongoing for some time. We perform contract research as requested, either replicated or in a demo fashion. We provide the co-operators the applications, the evaluations, and statistically summarize our reports. The trials are executed locally to give our clientele a look at their products under a realistic field condition. We can submit the R.A.s if needed, all results are confidential, and are owned by our clients. 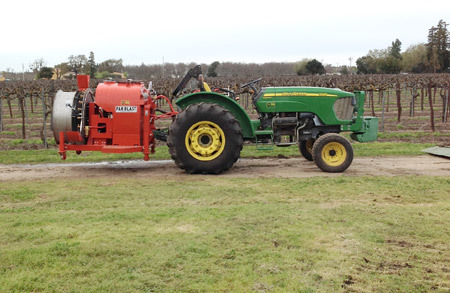 We do our own applications with a one of kind, custom designed research sprayer built by Rears. This allows us to apply small doses to small areas in a calibrated fashion with a speed sprayer rather than a mist blower or pressure gun. The application is as similar to a commonly applied speed sprayer application as we can provide, different only by allowing us to utilize small amounts of products and volumes, cutting back on waste and expenses for our clients.